GWS’ OneScore is a ranking methodology that combines engineering data with consumer research to provide a definitive performance score, identifying best-in-class mobile networks. 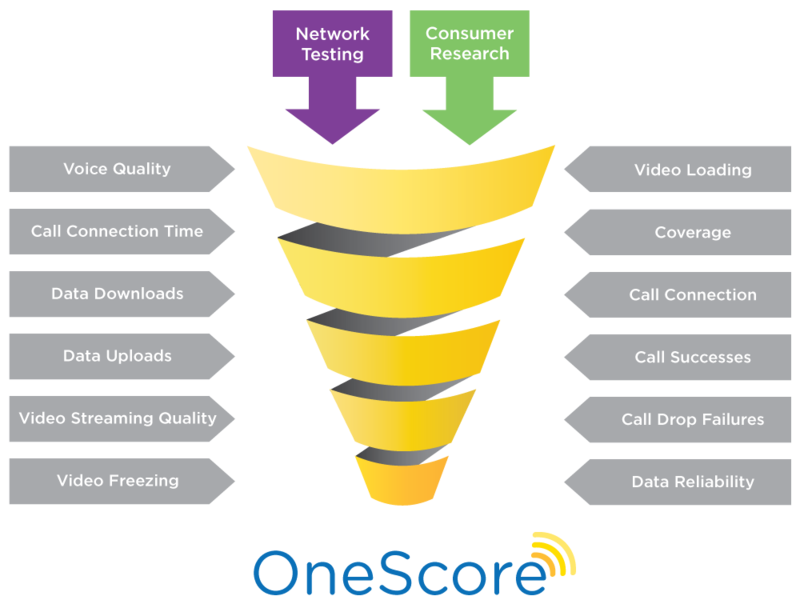 Taking into account both real-world network performance as well as real opinions from consumers on what they want from their network (from coverage to reliability, data speed, voice quality, and video performance), OneScore results in the industry’s most comprehensive evaluation of mobile networks. In addition to controlled, scientific testing of wireless networks, GWS annually conducts third-party nationwide polling of consumers. By combining these results, GWS is able to create the most balanced picture of the mobile experience that consumers care most about today. Traditionally, a network’s performance is tested by looking at factors like throughput or signal quality. This provides a good high-level overview of the state of a wireless network; but what does this mean to consumers using those networks? Would they rather be able to make a high quality call, or do they only care about fast data streaming? To truly understand how those networks are performing, it’s crucial to understand consumer expectations and behaviors when using their mobile devices. More specifically, the consumer survey includes questions asking respondents to rank the importance of different tasks they perform on their mobile device, as well as the importance of different aspects of network performance. Our network test results are then weighted according to how consumers prioritize what’s important to them, and evaluated in twelve different network performance areas related to voice, data, network reliability and network coverage. OneScore gives mobile operators a metric that not only looks at detailed network testing data but also takes into consideration how consumers are actually using their mobile devices and connections in the real world. This combination gives mobile operators a full picture of the true performance of their network in relation to their consumer’s expectations. OneScore offers a clear and meaningful ranking into how their mobile network operator is performing, based on the things that matter most to them. GWS is the world’s leading, independent provider of mobile benchmarking data — consumers trust in the rigor of testing and methodology that makes up OneScore. How Important is All of This to Consumers and Operators? Nearly two out of three customers in the U.S. would strongly consider changing operators if they experience poor service. At home or on the road, people want an operator that can provide reliable service; if not then they will find one who can. GWS has worked with major operators across the globe to provide the most scientifically tested network data and engineering analysis. And over the years, GWS has spent tens of millions of dollars investing in test equipment and developing unique voice and data benchmarking processes. Experience matters and has made GWS’s OneScore the industry standard for measuring network performance.